Design documentation and building instructions. 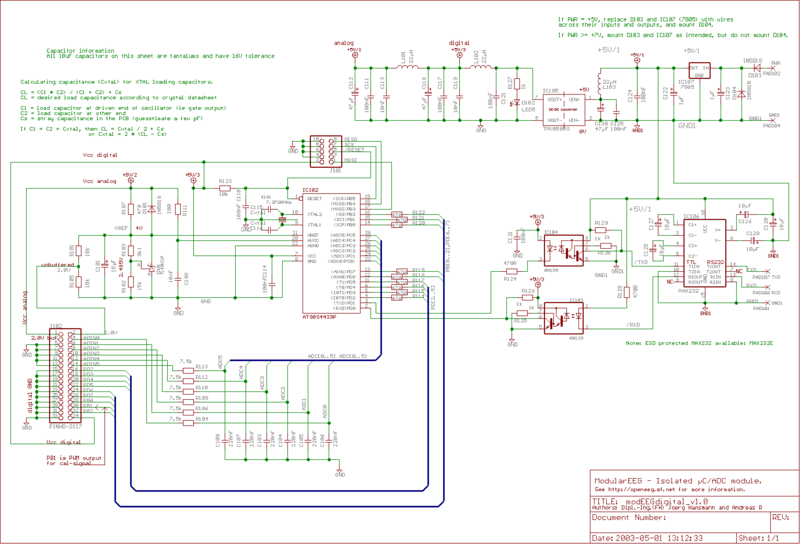 Amplifier schematic [55kb] and digital board schematic [48kb] as images. Hardware build tips assembled from the mailing list by Jim Peters. A safety disclaimer - read the WARNING. Note: The modularEEG itself is platform independent, however some of the tools and procedures I will describe here will only work on Windows OS. Linux should also work, however other software will be required. Serial cable (as described in the schematics (inside ModularEEG package)) to connect the modularEEG with the com-port of the PC. Note: The OLIMEX AVR-PG1B - STKxxx COMPATIBLE ICSP SERIAL PORT DONGLE PROGRAMMER will work also but requires another programming software (e.g. Pony Prog from Claudio Lanconelli) - I have not tested this combination, so you are on your own if you want to use it. Programming software (e.g. 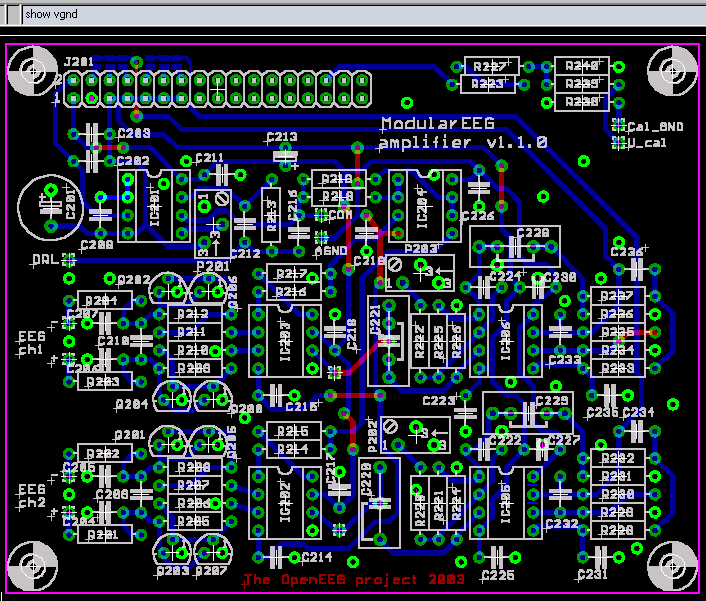 SP12) for flashing the firmware into the modularEEG uP. download the appropriate SP12 package for your OS. The features of sp12 version 2.0 are explained in sp12.txt.Separate readme's for each operating system describe the installation, and the runtime config files also have their own docs; look for those in the packages. ElectricGuru or some other program that can receive data from the modularEEG and display them as ADC-value over time. Read chapter "2.3 Testing the Microcontroller" and set up ElectricGuru correctly. Some isolated wires (inner diameter ca 0.5mm. Lace(cord, flex) will not work well). For some diagnosis procedures you will be asked to unplug some ICs and make some connections by plugging the wire ends (ca. 5mm isolation removed) into the emtpy IC sockets. So most (but not all) diagnosis connections can be done without soldering. Programming adapter shifted or rotated on J101. Make sure that J101 pin 1 matches with the red (sometime marked blue) cable of the programming adapter. # Atmel/Kanda STK200/300 starter kits. wrong timing (with SP12) on LPT2 with Multi IO-card. # Set clockSpdDefault to a suitable value in MHz. C127,128,126,129 mounted with false polarity or have less voltage than specified. Optocouplers defective (IC104) or inserted with wrong orientation (be carefull: IC104 is rotated 180 deg due to layout reasons) (IC103 is only for receiving data), wrong resistor values around IC104, broken traces, shortcuts. IC102 (AT90S4433, ATmega8) not flashed with firmware. AT90S4433 and ATmega8 require _different_ firmware versions. Unpack the tgz archive file until you get the SP12v2_0.7 folder. will need to install the GIVEIO device driver. from the device driver kit (DDK) for Windows NT. * NT: Control Panel->Devices->giveio->Start Up->Automatic. programming time constraints are minimum values. _sp12rc and sp12rc.txt for details). is large, read `bugs & bother' below. Connect the programming cable (2x5, 10 poles, digital pcb version 0.7 and later) with the PC-parallelport and the modularEEG 2x5 pinhead programming connector. Make sure PIN1 of the connector is aligned with PIN1 of the programming cable. Activate the power supply for the modularEEG. Running in SP12 cable/dongle compatible mode. Writing content of AT90S4433_modeeg_v0_07.rom into program area. If you see the above you have successfully flashed the firmware into the uC. Always disconnect the SP12cable before connecting the EEG to a test subject !!!! That is important because the programming cable (SP12cable) crosses the opto-isolator and connects PC-ground to EEG-Ground. So with the programming cable attached the modularEEG does not have any safety isolation. Click Start > Settings > Control Panel > Add / Remove Programs. In Add / Remove Programs select Properties and then click the Windows Setup tab. Click OK, and then OK again to install. Note: You may be asked for your Windows installation disk for this procedure. When Hyperterminal first loads via the "Hyperterminal" link, it will ask for a new connection. I suggest that you enter something descriptive, like "openEEG". It will next ask for a "Connect to" request. Select the COM port which is connected to the openEEG unit. At this point you will see data from the openEEG scroll down the screen, if it is connected and powered. You will also want to access the "File->Properties" page, "Settings" tab. Press the "ASCII Setup" button, and uncheck "echo typed characters locally"
No power (for the device) is required for this test. Connect IC106 (empty socket) PIN 14 with PIN 13 with a piece of wire. You now have a simple loopback circuit that echoes any data on (PC side) TxD to RxD. select "no protocol" (or no handshaking). You should now get an echo of any character you type in. Disconnect IC106 (empty socket) PIN 14 and PIN 13 (remove the wire inserted above). You should no more get an echo of any character you type in. Make sure the device has power. If you get the text below ( CKSE is 0001 ), your ATmega8 runs on internal 1Mhz instead of using the external 7.3728Mhz XTAL. Connect a little speaker or earphone from IC106 PIN14 (TXD) to GND1. Does it sound like this here? 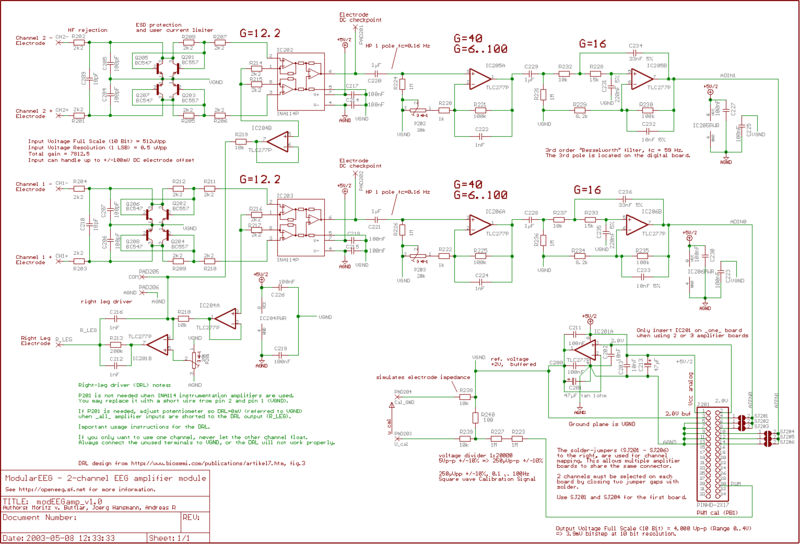 If the sound has lower pitch there is a problem with the XTAL frequency or ATmega8 fuses. If you do not hear any sound the data path from IC102 PIN3 to IC106 PIN14 is somewhere interrupted.